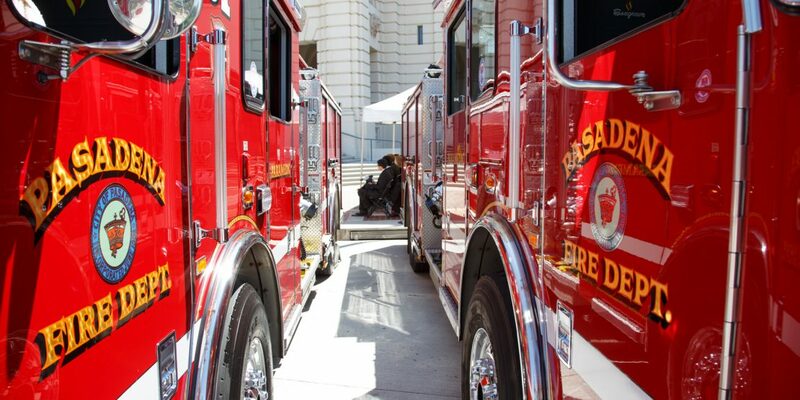 The mission of the Pasadena Fire Department is to provide protection of life, property, and the environment from the effects of fires, medical emergencies, and hazards; we engage the community in our mission through progressive community outreach. The members of the Pasadena Fire Department take pride in our commitment to professional service by maintaining our skills, knowledge and abilities. All members of the Department will conduct themselves in an ethical manner conforming to a moral standard of right versus wrong by treating each other and the people we serve humanely, decently, and honestly. Pasadena Fire Department members will adapt to the ever changing needs of our community, the organization and the environment. As members of the Pasadena Fire Department, we strive for honesty and fairness in our dealings with our customers and each other. We are honorable to our profession and we inspire each other to maintain trustworthiness, openness and sincerity. Members of the Pasadena Fire Department will be accountable to each other and the community we serve. We accept responsibility for our decisions and actions. 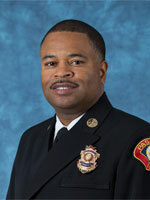 Bertral T. Washington is the Fire Chief for the City of Pasadena. Born and raised in southern California, Chief Washington was appointed by the City Manager on December 15, 2014 after 20 years of fire service in Las Vegas, NV. Chief Washington has worked in all disciplines of the fire service including Administration, Disaster Management, Fire Command, Prevention, Community Relations and Legislation. Chief Washington has a Chief Fire Officer (CFO) Designation from the Center for Public Safety Excellence (CPSE) and has led the department to become accredited by the Commission on Fire Accreditation International. Since his appointment, the department has also improved its Public Protection Classification rating to Insurance Services Office (ISO) Class One. Only 32 fire departments in the country are both accredited and ISO Class One. Chief Washington lives in Pasadena with his wife Cheri and two teenage children. He serves on various boards and committees including the American Red Cross San Gabriel Pomona Valley, First Tee of Greater Pasadena and Leadership Pasadena. Chief Washington follows Fire Chief Calvin E. Wells, who joined the Pasadena Fire Department in 1979 and served in numerous positions during his 35-year career. 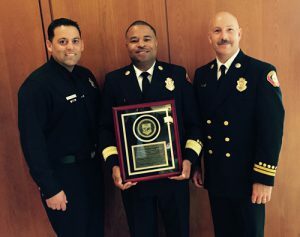 The Center for Public Safety Excellence’s (CPSE) Accreditation Program, administered by the Commission on Fire Accreditation International (CFAI) allows fire and emergency service agencies to compare their performance to industry best practices in order to determine community risk and safety needs, evaluate the performance of the department, and establish a method for achieving continuous organizational improvement. 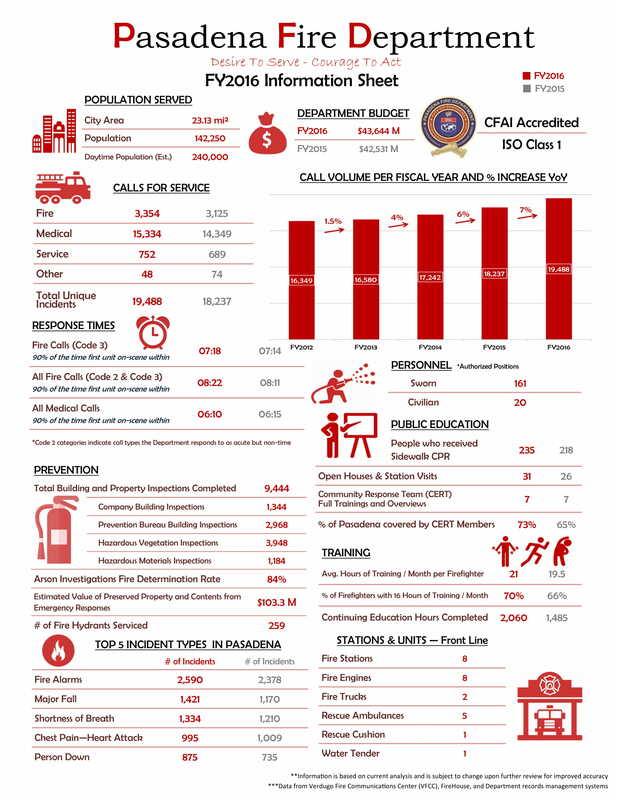 Pasadena Fire Department was accredited by CFAI on August 2015, after preparing a complete evaluation of performance indicators divided into 12 separate categories that was submitted for peer review. The Department continues to perform assessments and evaluations to meet internal, national, and internationally recognized benchmarks to ensure a high quality of fire and emergency services in our city for residents, community members, business leaders, and city officials. The city of Pasadena and Pasadena Fire & Rescue are proud to announce our designation as a Class 1 City by the Insurance Service Office (ISO), the highest possible rating for a municipality. Class 1 represents exemplary fire protection, and Class 10 indicates that the area’s fire-suppression program does not meet ISO’s minimum criteria. The Class 1 designation is determined by assessing the city’s ability to suppress fires, including facilities and practices such as the amount of personnel training, deployment of resources, the compliment of fire apparatus, the 911 dispatching system and the adequacy of the city’s water supply. A Class 1 city designation can also equate to lower insurance premiums for our residents and business owners depending on their respective insurance carriers. Pasadena is amongst a select group of 132 cities nationally and 14 in California to carry a Class 1 rating from ISO.